Louis Vuitton Company, commonly referred to as Loui Vuitton or shortened to LV, is a France fashion house and luxury retail company founded in 1854 by Loui Vuitton. The label's LV monogram appears on most of its products,ranging from luxury trunks and leather goods to ready-to-wear, shoes, watches, jewelry, accessories, sunglasses and books.Louis Vuitton is one of the world's leading international fashion houses; it sells its products through standalone boutiques, lease departments in high-end department stores, and through the e-commerce section of its website. For six consecutive years (2006–2012), Loui Vuitton was named the world's most valuable luxury brand. Its 2012 valuation was US$25.9 billion. The 2013 valuation of the brand was US$28.4 billion with revenue of US$9.4 billion. The company operates in 50 countries with more than 460 stores worldwide. The Louis Vuitton label was founded by Vuitton in 1854 on Rue Neuve des Capucines in Paris, France. Louis Vuitton had observed that the HJ Cave Osilite trunk could be easily stacked. In 1858, Vuitton introduced his flat-topped trunks with trianon canvas, making them lightweight and airtight. Before the introduction of Vuitton's trunks, rounded-top trunks were used, generally to promote water runoff, and thus could not be stacked. 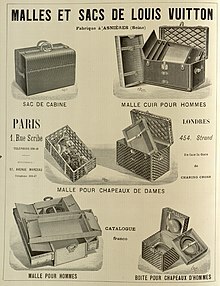 It was Vuitton's gray Trianon canvas flat trunk that allowed the ability to stack with ease for voyages. Many other luggage makers imitated LV's style and design. The company participated in the 1867 Universal Exhibition in Paris. In 1871, Ōyama Iwao became the first recorded Japanese customer, ordering a set of luggage while in Paris as a military observer during the Franco-Prussian War. To protect against the duplication of his look, Vuitton changed the Trianon design to a beige and brown stripes design in 1876. By 1885, the company opened its first store in London on Oxford Street. Soon thereafter, due to the continuing imitation of his look, in 1888, Vuitton created the Damier Canvas pattern, which bore a logo that reads "marque L. Vuitton déposée", which translates into "L. Vuitton registered trademark". In 1892, Louis Vuitton died, and the company's management passed to his son. After the death of his father, Georges Vuitton began a campaign to build the company into a worldwide corporation, exhibiting the company's products at the Chicago World's Fair in 1893. In 1896, the company launched the signature Monogram Canvas and made the worldwide patents on it. Its graphic symbols, including quatrefoils and flowers (as well as the LV monogram), were based on the trend of using Japanese Mon designs in the late Victorian era. The patents later proved to be successful in stopping counterfeiting. In this same year, Georges traveled to the United States, where he toured cities such as New York, Philadelphia, and Chicago, selling Vuitton products. In 1901, the Louis Vuitton Company introduced the Steamer Bag, a smaller piece of luggage designed to be kept inside Vuitton luggage trunks. During World War II, Louis Vuitton collaborated with the Nazis during the German occupation of France. The French book Louis Vuitton, A French Saga, authored by French journalist Stephanie Bonvicini and published by Paris-based Editions Fayard tells how members of the Vuitton family actively aided the puppet government led by Marshal Philippe Pétain and increased their wealth from their business affairs with the Germans. The family set up a factory dedicated to producing artifacts glorifying Pétain, including more than 2,500 busts. Caroline Babulle, a spokeswoman for the publisher, Fayard, said: "They have not contested anything in the book, but they are trying to bury it by pretending it doesn't exist." Responding to the book's release in 2004, a spokesman for LVMH said: "This is ancient history. The book covers a period when it was family-run and long before it became part of LVMH. We are diverse, tolerant and all the things a modern company should be." An LVMH spokesman told the satirical magazine Le Canard Enchaîné: "We don't deny the facts, but regrettably the author has exaggerated the Vichy episode. We haven't put any pressure on anyone. If the journalists want to censor themselves, then that suits us fine." That publication was the only French periodical to mention the book, LVMH is the country's biggest advertiser in the press. Louis Vuitton store in Lugano, Switzerland. Louis Vuitton store in Toronto, Ontario, Canada. During this period, Louis Vuitton began to incorporate leather into most of its products, which ranged from small purses and wallets to larger pieces of luggage. In order to broaden its line, the company revamped its signature Monogram Canvas in 1959 to make it more supple, allowing it to be used for purses, bags, and wallets. It is believed that in the 1920s, counterfeiting returned as a greater issue to continue on into the 21st century. In 1966, the Papillon was launched (a cylindrical bag that is still popular today). By 1977 with annual revenue up to 70 million Francs ($14.27 million US$). A year later, the label opened its first stores in Japan: in Tokyo and Osaka. In 1983, the company joined with America's Cup to form the Louis Vuitton Cup, a preliminary competition (known as an eliminatory regatta) for the yacht race. Louis Vuitton later expanded its presence in Asia with the opening of a store in Taipei, Taiwan in 1983 and Seoul, South Korea in 1984. In the following year, 1985, the Epi leather line was introduced. 1987 saw the creation of LVMH. Moët et Chandon and Hennessy, leading manufacturers of champagne and cognac, merged respectively with Louis Vuitton to form the luxury goods conglomerate. Profits for 1988 were reported to have been up by 49% more than in 1987. By 1989, Louis Vuitton came to operate 130 stores worldwide. Entering the 1990s, Yves Carcelle was named president of LV, and in 1992, his brand opened its first Chinese location at the Palace Hotel in Beijing. Further products became introduced such as the Taiga leather line in 1993, and the literature collection of Voyager Avec... in 1994. In 1996, the celebration of the Centennial of the Monogram Canvas was held in seven cities worldwide. In 1997, Louis Vuitton made Marc Jacobs its Artistic Director. In March of the following year, he designed and introduced the company's first "prêt-à-porter" line of clothing for men and women. Also in this year products introduced included the Monogram Vernis line, the LV scrapbooks, and the Louis Vuitton City Guide. The last events in the 20th century were the release of the mini monogram line in 1999, the opening of the first store in Africa in Marrakech, Morocco, in 2000, and finally, the auction at the International Film Festival in Venice, Italy, where the vanity case "amfAR" designed by Sharon Stone was sold, with the proceeds going to the Foundation for AIDS Research (also in 2000). The store on Manhattan's Fifth Avenue. A Louis Vuitton boutique in the Galleria Vittorio Emanuele II, in Milan, Italy. A Louis Vuitton store in Central, Hong Kong. Louis Vuitton store in Singapore. A Louis Vuitton store in Las Vegas. Louis Vuitton VIP room in Vienna for ordering custom designed goods. By 2001, Stephen Sprouse, in collaboration with Marc Jacobs, designed a limited-edition line of Vuitton bags that featured graffiti written over the monogram pattern. The graffiti read Louis Vuitton and, on certain bags, the name of the bag (such as Keepall and Speedy). Certain pieces, which featured the graffiti without the Monogram Canvas background, were only available on Louis Vuitton's V.I.P. customer list. Jacobs also created the charm bracelet, the first ever piece of jewelry from LV, within the same year. In 2002, the Tambour watch collection was introduced. During this year, the LV building in Tokyo's Ginza district was opened, and the brand collaborated with Bob Wilson for its Christmas windows scenography. In 2003, Takashi Murakami, in collaboration with Marc Jacobs, masterminded the new Monogram Multicolore canvas range of handbags and accessories. This range included the monograms of the standard Monogram Canvas but in 33 different colors on either a white or black background. (The classic canvas features gold monograms on a brown background.) Murakami also created the Cherry Blossom pattern, in which smiling cartoon faces in the middle of pink and yellow flowers were sporadically placed atop the Monogram Canvas. This pattern appeared on a limited number of pieces. The production of this limited-edition run was discontinued in June 2003. Within 2003, the stores in Moscow, Russia and in New Delhi, India were opened, the Utah and Suhali leather lines were released, and the 20th anniversary of the LV Cup was held. Louis Vuitton situated on the famous Champs-Elysées. Louis Vuitton on Briggate, Leeds. In 2004, Louis Vuitton celebrated its 150th anniversary. The brand also inaugurated stores in New York City (on Fifth Avenue), São Paulo, Mexico City, Cancun and Johannesburg. It also opened its first global store in Shanghai. By 2005, Louis Vuitton reopened its Champs-Élysées store in Paris designed by the American Architect Eric Carlson and released the Speedy watch collection. In 2006, LV held the inauguration of the Espace Louis Vuitton on its 7th floor. In 2008, Louis Vuitton released the Damier Graphite canvas. The canvas features the classic Damier pattern but in black and grey, giving it a masculine look and urban feel. Also in 2008, Pharrell Williams co-designed a series of jewelry ("Blason") and glasses for Louis Vuitton. In 2010, Louis Vuitton opened what it described as their most luxurious store in London. In early 2011, Louis Vuitton hired Kim Jones as its "Men Ready-to-Wear Studio and Style Director". He became the lead designer of menswear while working under the company-wide artistic directorship of Marc Jacobs. 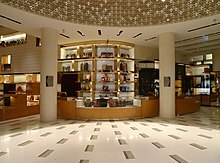 On 17 September 2011, the company opened its Louis Vuitton Island Maison at Marina Bay Sands, Singapore. As of September 2013[update], the company hired Darren Spaziani to lead its accessory collection. On 4 November 2013, the company confirmed that Nicolas Ghesquière had been hired to replace Marc Jacobs as artistic director of women's collections. Ghesquière's first line for the company was shown in Paris in March 2014. On 7 April 2014, Edouard Schneider became the head of press and public relations at Louis Vuitton under Frédéric Winckler, who is Vuitton's communications and events director. On 26 March 2018, Virgil Abloh was named artistic director of men's wear—he is the label's first African-American artistic director and one of few black designers of a major European fashion house. His debut show was held at the 2018 Paris Men's Fashion Week and staged in the historical Palais-Royal gardens' courtyard. The Louis Vuitton brand and the LV monogram are among the world's most valuable brands. According to a Millward Brown 2010 study, Louis Vuitton was then the world's 19th most valuable brand, and was estimated to be worth over US$19 billion. For six consecutive years, Louis Vuitton was number one of the 10 most powerful brands list published by the Millward Brown Optimor's 2011 BrandZ study with value of $24.3 billion. It was more than double the value of the second ranking brand. A Louis Vuitton "Sarah Wallet"
The company actively seeks to eradicate counterfeiting, and employs a team of lawyers and special investigation agencies to pursue offenders through the courts worldwide. The company allocates approximately half of its communications budget to counteract counterfeiting of its goods. LVMH, Vuitton's parent company, has described "Some 60 people at various levels of responsibility working full-time on anti-counterfeiting in collaboration with a wide network of outside investigators and a team of lawyers." The company closely controls the distribution of its products. Until the 1980s, Vuitton products were widely sold in department stores, such as Neiman Marcus and Saks Fifth Avenue. Today, Vuitton products are primarily available at company-owned Louis Vuitton boutiques, with a small number of exceptions noted in upscale shopping districts or inside luxury department stores. Company boutiques within department stores operate independently, and are operated by company managers and employees. LV has an official online store, through its main website. In 2006, the company filed a lawsuit against Colorado-based Manifest Information Services Ltd. (aka Manifest Hostmaster and Manifest.com), through WIPO, in order to compell Manifest transfer the domain name LV.com to Louis Vuitton; the legal action failed and the domain was subsequently acquired by Liverpool Victoria (LV=), England's largest fraternal insurance company. Several high-profile rap music artists have mentioned the company in song lyrics, most notably: Bohemia, Kanye West, Juicy J, and Wiz Khalifa. Since the 19th century, Louis Vuitton trunks have been made by hand. Contemporary Fashion gives a preview of the creation of the LV trunks: "The craftsmen line up the leather and canvas, tapping in the tiny nails one by one and securing the five-letter solid pick-proof brass locks with an individual handmade key, designed to allow the traveler to have only one key for all of his or her luggage. The wooden frames of each trunk are made of 30-year-old poplar that has been allowed to dry for at least four years. Each trunk has a serial number and can take up to 60 hours to make, and a suitcase as many as 15 hours." Iconic bags of Louis Vuitton include the Speedy bag and Neverfull bags. Each season Louis Vuitton produces rare, limited edition bags that are generally only available by reservation through larger Louis Vuitton stores. Many of the company's products utilize the brown Damier and Monogram Canvas materials, both of which were first used in the late 19th century. All of the company's products exhibit the eponymous LV initials. The company markets its product through its own stores located throughout the world, which allows it to control product quality and pricing. It also allows LV to prevent counterfeit products entering its distribution channels. In addition, the company distributes its products through the company's own website, LouisVuitton.com. The Louis Vuitton company cultivates a celebrity following and has featured famous models, musicians and actors, such as Jennifer Lopez, Keith Richards, Madonna, Sean Connery, Matthias Schoenaerts, Angelina Jolie, Gisele Bündchen, Mikhail Gorbachev, and David Bowie in its marketing campaigns. The company commonly uses print ads in magazines and billboards in cosmopolitan cities. Louis Vuitton Posters by Razzia were popular in the 1980s. It previously relied on selected press for its advertising campaigns (frequently involving prestigious stars like Steffi Graf, Andre Agassi and Catherine Deneuve) shot by Annie Leibovitz. However, Antoine Arnault, director of the communication department, has recently decided to enter the world of television and cinema: The commercial (90 seconds) is exploring the theme "Where will life take you?" and is translated into 13 different languages. This is the first Vuitton commercial ad ever and was directed by renowned French ad director Bruno Aveillan. In 2002, president and CEO of LVMH Watches Daniel Lalonde (later, global CEO for LVMH brands Moët and Dom Pérignon) recruited celebrities, such as Maria Sharapova, Brad Pitt, Tiger Woods, and Uma Thurman, for advertising campaigns photographed by Patrick Demarchelier. Ads featuring Woods reportedly led to a 30% boost in sales, resulting in TAG Heuer being rated as the No. 2 luxury watch brand in America by 2005. Louis Vuitton has had many collaborations with prominent artists and designers. Takashi Murakami created special edition collections, such as the Monogramouflage Collection, which debuted in 2008, and a previous collection, released in 2002, which featured some of his artwork. The creations were "painted" over the traditional monogram canvas, which brought a radical new twist to the timeless design. Marc Jacobs also commemorated a previous collaboration, designed by Stephen Sprouse. This collection, originally released in 2001, featured bold print that looked like graffiti, over the traditional canvas. The recreation of the collab used the same idea, but gave it a new twist using bold colors, like hot pink, neon green, and orange, that also glow in the dark. This recreated version of the graffiti collection was finally released in 2009 to much fanfare. Louis Vuitton also collaborated with Kanye West in 2009, designing his own limited run of shoes. Most recently, Jacobs teamed up with Yayoi Kusama to create the "Infinitely Kusama" Collection, which features bold colors of dots over the vernis leather or the monogram canvas. These pieces come in black with white dots, red with white dots, and yellow with black dots. It was released in July 2012. Louis Vuitton Collaborated in their Spring-Summer 2016 collection advertising campaign. with the highly popular japanese Video game Franchise Final Fantasy and their Games Main Heroin called Lighting from Final Fantasy 13. In 2017 Louis Vuitton collaborated with American streetwear brand Supreme (brand), releasing products in various pop-up stores in major cities around the world. Items feature the Louis Vuitton monogram canvas mixed with the Supreme box-logo design. Also in 2017, Louis Vuitton collaborated with artist Jeff Koons for two collections in an effort to "further [explore] the intersection of fashion and art." On 19 November 2007 Louis Vuitton, in further efforts to prevent counterfeiting, successfully sued Britney Spears for violating anti-counterfeiting laws. A part of the music video for the song "Do Somethin'" shows fingers tapping on the dashboard of a hot pink Hummer with what looks like Louis Vuitton's "Cherry Blossom" design bearing the LV logo. Britney Spears herself was not found liable, but a civil court in Paris ordered Sony BMG and MTV Online to stop showing the video. They were also fined €80,000 to each group. An anonymous spokesperson for LVMH stated that the video constituted an "attack" on Louis Vuitton's brands and its luxury image. On 13 February 2007, Louis Vuitton sent a Cease and desist order to Danish art student Nadia Plesner for using an image of a bag that allegedly infringed Louis Vuitton's intellectual property rights. Plesner had created a satirical illustration, "Simple Living", depicting a malnourished child holding a designer dog and a designer bag, and used it on T-shirts and posters to raise funds for the charity "Divest for Darfur". On 25 March, the court ruled in favour of LV that the image was a clear infringement of copyright. Despite the ruling, Plesner continued to use the image, arguing artistic freedom, and posted copies of the Cease and desist order on her website. On 15 April 2008, Louis Vuitton notified Plesner of the lawsuit being brought against her. Louis Vuitton demanded $7,500 (€5,000) for each day Plesner continues to sell the "Simple Living" products, $7,500 for each day the original Cease and desist letter is published on her website and $7,500 a day for using the name "Louis Vuitton" on her website, plus legal and enforcement costs. An LVMH spokeswoman interviewed by New York Magazine said that Louis Vuitton were forced to take legal action when Plesner did not respond to their original request to remove the contested image, nor to the subsequent Cease and desist order. In October 2008, Louis Vuitton declared that the company had dropped its lawsuit but have since reopened it along with a new €205,000 claim due to a painting by the same artist. In May 2011, the court in The Hague found in favour of Plesner's right to freedom of expression. In May 2010, the British Advertising Standards Authority banned two of the company's advertising spots, depicting craftsmen at work on its products, for being in breach of its 'Truthfulness clause'. The ASA said that the evidence supplied by Louis Vuitton fell short of what was needed to prove the products were made by hand. The ASA said that the two adverts would lead consumers to interpret that Louis Vuitton bags and wallets were almost entirely hand-crafted when they were predominantly created by machine. In February 2013, Louis Vuitton issued a complaint against the owner of a barber shop in Hong Kong for allegedly violating its intellectual property rights in relation to a stool using fabric coating that is similar to the checker pattern in Louis Vuitton's handbags. According to the Hong Kong-based Apple Daily newspaper, the company was seeking a compensation of HK$25,000 (around US$3,200) and the publication of an apology in the form of newspaper advertisement. The owner had sourced basic furniture and equipment from the PRC for starting his shop. Facing this accusation, the barbershop owner said he had no means to tackle Louis Vuitton and may have to close down his shop which has been operating for 1 year in a remote local district on Hong Kong Island. The controversy had caused tremendous concern on Hong Kong news forums and viral protest on Facebook pages. In May 2017, media reported on alleged mistreatment of a model, who was to appear on a Louis Vuitton cruise show in Kyoto. The 20-year-old model who, on arrival, measured 91.5 cm (36 in) around her hips was told she was "too bloated" and "too big" for her ensemble and instructed to drink only water for 24 hours. The model alleged that she was only informed via her agent in France, who received an email including the text "[she] came yesterday in Tokyo to do her final fitting, and she doesn't fit the exact same dress anymore. She has a belly, her face is more puffy [sic] and the back of her dress is open and you can see it is tight." Despite following the instructions, she was eventually excluded from the show. The model stated that she has "received hundreds of messages from models" who have experienced similar mistreatment from the same Louis Vuitton casting director. The casting director denied the allegations and explained the instructions regarding intake of water as a misunderstanding, that the model was instructed that her intake of liquids was to be limited to water. 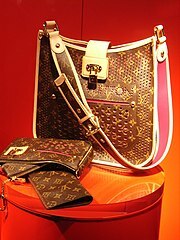 Wikimedia Commons has media related to Louis Vuitton. ^ "lvmh moet hennessy louis vui (MC:EN Paris): Executive profile: Michael Burke". Bloomberg Business. Retrieved 15 February 2015. ^ "Virgil Abloh appointed Louis Vuitton Creative Director". ^ "Louis Vuitton on the Forbes World's Most Valuable Brands List". forbes.com. ^ "Louis Vuitton Annual Report 2014" (PDF). lvmh-static.com. ^ "Legal Notice". Louis Vuitton. Archived from the original on 1 May 2011. Retrieved 24 April 2010. ^ a b c d e f g h i j k l Martin, Richard (1995). Contemporary fashion. Guatemala: St. James Press. p. 750. ISBN 1-55862-173-3. ^ Roberts, Andrew. "Louis Vuitton Tops Hermes As World's Most Valuable Luxury Brand". Bloomberg L.P. Retrieved 28 May 2012. ^ a b c d e f g h i j k l m n o p q r s t u "Timeline". Louis Vuitton. Archived from the original on 19 December 2008. Retrieved 3 March 2008. ^ "A large suitcase of coffee color leather, with leather straps and with black and claret paited owner's stripes, monogrammed R.F., the interior fitted with a tray and labelled H.J. Cave and Sons 'Osilite' trademark-31.5 x 18 x 11in. (80 x 46 x 26cm. ); another matching smaller case-29 x 17 x 10in. (74 x 43 x 25.5cm. ); and a smaller lightweight case, the interior labelled as above-24 x 13.75 x 6in. (61 x 35 x 15cm. ), 1930s (3)". Christies.com. 25 January 2000. Retrieved 7 November 2012. ^ Horne, Alistair (2015). Hubris: The Tragedy of War in the Twentieth. W&N. p. 30. ISBN 978-0297867623. ^ Vuitton, Louis. "News By Louis Vuitton: EXHIBITION IN TOKYO: INSPIRATIONAL JAPAN". eu.louisvuitton.com. ^ a b c Willsher, Kim (3 June 2004). "Louis Vuitton's links with Vichy regime exposed, The Guardian, June 3, 2004". London. Retrieved 11 May 2010. ^ "1977 Exchange Rates" (PDF). Retrieved 16 May 2010. ^ "Marc Jacobs". Louis Vuitton. Retrieved 26 May 2012. ^ "Hip-hop's glittering touchstone". The Australian. Retrieved 27 February 2009. ^ Zenner, Brittany. "Insidelux.com". Insidelux.com. Archived from the original on 14 May 2011. Retrieved 29 April 2011. ^ White, Belinda. "Kim Jones takes the helm at Louis Vuitton menswear". The Telegraph. Retrieved 26 May 2012. ^ "Louis Vuitton Island Maison unveiled in Singapore". Pursuitist. "Business Insider. 14 October 2011. Retrieved 10 November 2018. ^ Socha, Miles (24 September 2013). "Louis Vuitton Taps Accessories Designer Darren Spaziani". WWD. Retrieved 24 September 2013. ^ Socha, Miles (4 November 2013). "Louis Vuitton Confirms Nicolas Ghesquière Hire". WWD. Retrieved 4 November 2013. ^ Socha, Miles (17 March 2014). "Louis Vuitton Taps Edouard Schneider to Head P.R." WWD. Retrieved 18 March 2014. ^ "Louis Vuitton Names Virgil Abloh as Its New Men's Wear Designer". Retrieved 12 August 2018. ^ "Virgil Abloh Tells Louis Vuitton's Story of Fashion". Retrieved 12 August 2018. ^ "Designer Virgil Abloh unveiled his first-ever Louis Vuitton collection at Fashion Week in Paris". Newsweek. 21 June 2018. Retrieved 12 August 2018. ^ a b "Louis Vuitton Logo: Design and History". FamousLogos.net. Retrieved 12 October 2011. ^ "Millwardbrown.com". Archived from the original on 1 January 2011. Retrieved 29 April 2011. ^ LuxuryDiffusion.com. "LuxuryDiffusion.com Highlights Louis Vuitton Most Valuable Luxury Brand For Sixth Consecutive Year". PRLog. ^ "European trademarks vs. Google". ^ "Times Online: Special Report: Trying to stub out the fakes". The Times. London. 11 June 2006. Retrieved 11 May 2010. ^ "Louis Vuitton: luxury leather luggage, French fashion designer". Retrieved 4 March 2008. ^ Louis Vuitton Malletier S.A. v. Manifest Information Services c/o Manifest Hostmaster accessed 24 February 2015. ^ "Louis Vuitton - A Legendary". Louis Vuitton. 2016. ^ Levin, Dan (5 November 2007). "Louis Vuitton Ad Shows Gorbachev Accompanied by Subversive Text". The New York Times. Retrieved 5 November 2007. ^ "Fashion Week Daily – Dispatch". Archived from the original on 9 December 2012. Retrieved 4 March 2008. ^ Gupte, Pranay "Daniel Lalonde Works His Marketing Magic for LVMH", The New York Sun, May 16, 2005. Retrieved November 29, 2018. ^ "Louis Vuitton Wins Spears Video Lawsuit". FOXNews. Associated Press. 20 November 2007. Archived from the original on 21 November 2007. Retrieved 20 November 2007. ^ "Art Student Nadia Plesner's Giant Louis Vuitton Copyright Suit". New York. 6 May 2008. Retrieved 12 May 2011. ^ a b "Louis Vuitton Tried to Prevent the Nadia Plesner Lawsuit". New York. 9 May 2008. Retrieved 12 May 2011. ^ Masnick, Mike (25 April 2008). "Louis Vuitton Sues Darfur Fundraiser; Seems Unclear On The Concept Of Trademark". Techdirt. Retrieved 12 May 2011. ^ Beck, Cecilie (27 October 2008). "Beck: Franske hyklere". Ekstra Bladet (in Danish). Retrieved 12 May 2011. ^ Stiernstedt, Jenny (9 March 2011). "Målade en väska – ska böta 1.820.000". Dagens Nyheter (in Swedish). Archived from the original on 29 April 2011. Retrieved 12 May 2011. ^ "Artist wins suit against fashion icon". The Copenhagen Post. 5 May 2011. Archived from the original on 13 May 2011. Retrieved 12 May 2011. ^ a b "Louis Vuitton ads banned after design house misled customers by suggesting its bags were hand-stitched". Daily Mail. London. 26 May 2010. Retrieved 12 May 2011. ^ "Louis Vuitton sues Hong Kong Barber shop for a checkered stool". Apple Daily. Hong Kong. 5 March 2013. Retrieved 5 March 2013. ^ "Louis Vuitton sues Hong Kong shops for S-Lock copyright". Apple Daily. Hong Kong. 6 March 2013. Retrieved 6 March 2013. ^ Fisher, Kendall (19 May 2017). "Louis Vuitton Casting Director Responds to Size 4 Model Who Claims She Was Sent Home From Show for Being Too Big". E!. Retrieved 22 May 2017. ^ Ahmed, Osman (19 May 2017). "Ashley Brokaw and Ulrikke Hoyer Speak on Louis Vuitton Casting Controversy". businessoffashion.com. Retrieved 22 May 2017. This page was last edited on 19 April 2019, at 18:36 (UTC).